Daniel Hallin is a journalist and professor of media systems who wrote The Uncensored War: The Media and Vietnam about the way journalists covered the Vietnam war through a description of three spheres of ideas on which journalists report. At the two extremes are the sphere of consensus, for ideas journalists assume their readers accept and agree with; and the sphere of deviance, for ideas that the journalists believe their readers disagree with vehemently. Between the two is the sphere of legitimate controversy where a journalists assumes her readers believe that there may be debate. 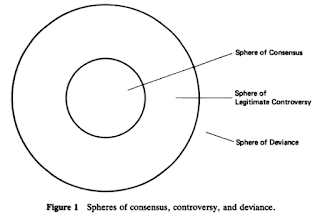 These spheres come together like a donut, with the sphere of deviance outside the donut, the sphere of legitimate controversy making up the dough, and the sphere of consensus, the hole in the middle (the Canadian in me can't help but think of it as the Timbit of consensus). 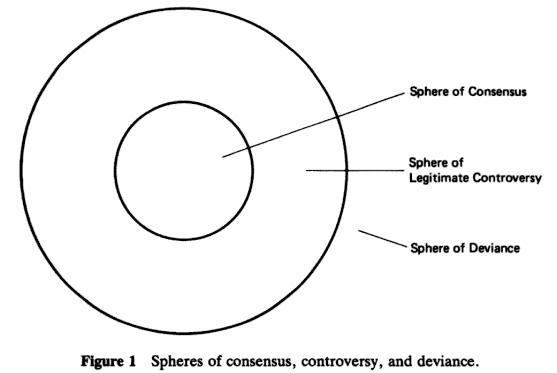 Hallin observed that within the spheres of deviance or consensus, journalists would deviate from "objective" journalism in a variety of ways, such as adopting sphere of consensus views without challenge, excluding sphere of deviance sources and ideas from any mention in their stories, and generally reinforcing the divisions between the spheres. For more specifically on Hallin Spheres and the effect of the the Internet on mainstream media ability to maintain them, see Jay Rosen, Audience Atomization Overcome: Why the Internet Weakens the Authority of the Press (more on that below). A diagram from Hallin's book discussing the spheres is below from Google Books. University of California Press (1989), p 117. Joseph Overton was writer and think tanker who proposed the window as a metaphor for understanding which ideas are viable from a political perspective in a certain community. Ideas in the window are viable and can be debated and adopted. Ideas outside the window cannot. 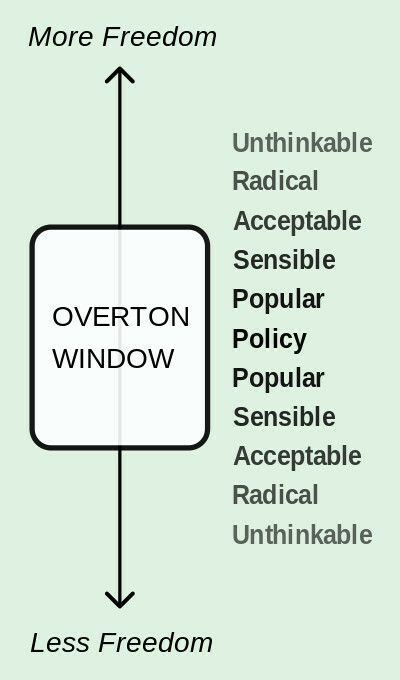 Overton appears to have seen the window along a continuum of more and less government intervention (which many on the right would call "less free" and "free") and believed that while the window constrained policy discussions, it was political and social forces that could change whether ideas were inside or outside of the window. 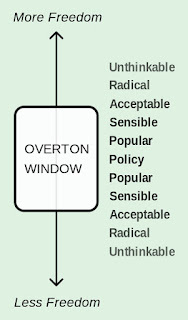 The Overton Window has been in the news a lot lately as a way to explain that normalizing extremely radical ideas can move the whole window towards those ideas and thereby move some slightly less radical ideas into the center of the window. For example, see Politico's How an Obscure Conservative Theory Became the Trump Era’s Go-to Nerd Phrase and Vox Media's description. For more on these cases, listen to the difference between the oral arguments in Plessy and Brown, and read Justice Harlan's dissent in Plessy. In the language of Hallin Spheres, segregation being detrimental and not "equal," moved from pretty close to the sphere of deviance for the Court, to the Sphere of consensus. And, there have been similarly important, radical, and progressive shifts in Supreme Court understanding of specific words in the constitution in many other areas that I care about. As Jay Rosen and Shaun Lau have said better than I ever could, the Internet and its propensity to allow for many more speakers to join the conversation have had a significant effect on windows and spheres in the mainstream media, on internet media, and in society at large. Lau makes the same point before expanding on it to a bigger point about how internet communities affect discourse in this excellent thread. He's writing about how Jemelle Hill's description of Donald Trump as a white supremacist was seen by ESPN as in the sphere of deviance, whereas many on the Internet disagreed. You should go read it. "Put only Montagues in a room, and you have consensus. Now put a few Capulets in. 'What happened to all the consensus?' The answer is that there never was consensus; there was only agreement among those with access or those represented by those with access. "Internet pushback" when the internet- and very specifically twitter- is more meritocratic than, let's say large corporations like ESPN? That's not "the internet" pushing back. It's those who you didn't allow in the room before we forced our way in via new technology. PEOPLE." From @NoTotally Twitter thread, Sept. 15, 2017. Both of these observations mean that it can be harder to create spheres of consensus, that it is harder to maintain them once created, and that we might expect spheres of legitimate controversy to grow. Years of forward societal progress based in part on expanding and shifting the Overton Window and sphere of legitimate controversy may make you think, this is great! But hold on, some ideas are in the sphere of deviance for a reason. Racism is one good and sadly timely example. Same with some people. The Internet and its platforms have created many spaces for marginalized people to congregate and become less marginalized by removing gatekeepers who might enforce spheres and windows to exclude. On the internet, nobody needs permission to speak. Again, that's often good progress. But, some groups are marginalized for a very good reason. Nazis are a good and sadly timely example. Bringing racism and Nazis back into the window is VERY, VERY BAD, and yet the relative lack of speech gatekeepers in the U.S. Constitution, on the Internet, and on many Internet platforms may make this more likely. This is not a malfunction, but a design feature of the Internet and many of its platforms. What can online platforms and communities do? It is worth noting that spheres and windows are a bit of a misnomer for these phenomenon because not only can they be different sizes in different communities, they can also be pretty permeable along the edges and can change size or permeability. Just as importantly, they can change shape. There is nothing that says that a particular society, medium, or context needs to treat all ideas that are equidistant from the center of consensus as equal. The sphere need not be a sphere, it can be oblong and irregular. The window can be slanted and weird looking. In other words, it is not a law of nature that determines that two ideas that are believed by a similar number of people need to be treated the same. That said, I don't know of many good examples outside of heavily editorial ones with a relatively small set of content producers, that have been able to be both extremely inclusive and progressive towards what I think are the "right" kind of marginalized ideas while keeping out the ones that I think are marginalized for very good reason (and I use "I" here as a measure because different people differ quite a bit on these judgments). If anything, there are concerns that attempts to suppress speech by groups that should be marginal are often used against those that shouldn't. Many of the larger Internet platforms are trying, with varying degrees of success and failure, to do this right, as I was when I worked at Google and Twitter. That said, I don't have a great example of a platform or community that is working exactly as I would like. And it seems like that is a big and worthy challenge. Anyhow, there is probably a whole 'nother post from me on this, but that's for another day, this one is already long enough. P.S. If you have examples of platforms or communities doing this extremely well at scale, please forgive me for not including them and help me fix my error by pointing me towards them @amac.